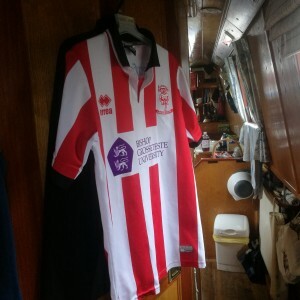 Narrowboating Chick | Happy and Healthy at Hatherton Marina. 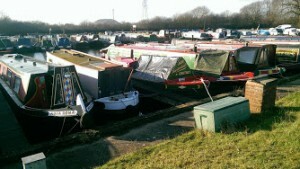 Harebell, far left, safe and sound;Moored at Hatherton Marina. Today, the morning dawned cold & frosty but fantastically sunny. As has been the case quite a lot over the last few sunny days, my mind turned to boating; I miss my boat- I’m keen to get going, to one day enjoy the relaxation of moving at 4 mph and the next to set ourselves a challenge of a long flight of locks in the most efficient way. This weekend we will be down at the boat “de-winterising” her- Filling the water tank up and charging the batteries etc and mooching about the local area buying the bits and bobs that are needed. She’s at Hatherton Marina on the Staffs & Worcester and we are in a great position geographically- the fabulous Penkridge Market is a few miles down the road, Cannock has good shopping facilities and for the serious shopping trip, we can go to Wallsall or Wolverhampton. The Go Outdoors superstore at Wolverhampton is a particular favourite as one of our group always seems to leave some essential item of outdoor clothing at home. On various social media threads throughout the online boating community, opinion is divided (not always amicably either!!) between Linear Moorings and Marina Moorings. For us, the choice of a Marina mooring was really a no brainer; we needed the peace of mind knowing that the boat was secure and also under watchful eye. I had been visiting Hatherton Marina for the last 10 years, as my in law’s have had their boat, Aqua Roma, moored there for the last 20 or so years, but all through the purchase process we dreamed of being a little more “adventurous” with our choice of marina……The list was endless, Aston Marina at Stone to be centrally located, Anderton Marina for easy visits to the boat lift, Aqueduct Marina on the Middlewich for the choice of a few cruising rings- the world (well, canal) was our oyster. 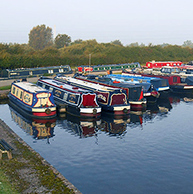 As we had made quite a few trips to Sawley Marina through the purchasing of the boat and we loved the chandlery, clothes store, the mini mart, the coffee shop. Soon enough we were missing the peace and tranquility of Hatherton. Many a hot summer night we have spent a quiet night on Aqua Roma with all the doors open because we know we are secure. Buying a boat is an expensive business- we had recently been told that “Boat” is an acronym for “Bring Out Another Thousand”and we can’t argue with that one. Before even being able to sail her away, we needed a licence and before we could be issued with that, of course we needed a home mooring. The final aspect that was to seal the deal with choosing Hatherton was the price. Money talks, but it also makes decisions. Most marinas have a monthly cost and a cheaper annual fee, to be paid upfront- great if you have the money, but we didn’t. But it turns out that we didn’t need to either. Hatherton is charging us a monthly fee that works out less over the year than the “cheaper annual fee”. Again, no brainer. I’m looking forward to this weekend. We won’t leave the Marina by water, but we’re just as happy staying put for a few days- after all the big trip to Llangollen is only a few short weeks away. The available facilities are sufficient for our needs; parking, electricity, toilets, showers and elsan disposal. New for 2015 is the re-opened bar & restaurant a few minutes walk away- close by but not close enough to interfere with the peace & tranquility of the surroundings- essential, as we have no desire to release our inner Victor Meldrews!! 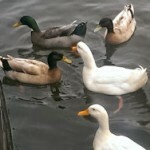 My son is also looking forward to the weekend- he gets to see his & his Grandma’s “Duck Squad” of the 5 musketeers as they are known in our family- James has taken to sitting on the hatch, eating his breakfast and chatting to the madly quacking ducks, but that’s another story for another day! Join Hatherton on Facebook and like their page, or for the 140 character challenge, Twitter.